Pointwise Version 17.3 R2 is now available for download and production use. Following on the addition of overset grid assembly to Pointwise V17.3 R1, this latest release includes expanded support for generating overset structured grids. Also, Pointwise now includes native support for two more CAE solvers and updated interfaces for two others. The previous release of Pointwise included a suite of tools for overset grid assembly. Because structured hexahedral grids are so widely used in overset systems, two major improvements were made to Pointwise's structured overset grid capabilities. 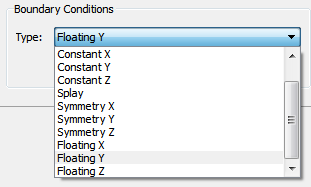 The boundary conditions available in the Extrude command have been expanded to include the following. Also, several other boundary conditions have been updated including those listed below. Several of the new and updated BCs are shown in Figure 1. Note that some boundary conditions are automatically applied due to the grid's topology and therefore do not appear in the menu. Figure 1: New and updated boundary conditions are available for the extrusion of structured hex grids. Pointwise now supports two additional types of structured grid topologies widely used within the overset grid community. These are known to users of HYPGEN/OVERGRID as O-type and C-type wing cap topologies. These topologies are unique in that the extruded block face contains point and line singularities which, when inflated, form degenerate, but well formed, hexahedral cells. Native interfaces to the following CAE solvers have been added or updated. Pointwise now supports (on Microsoft Windows only) the Leap Motion Controller, a compact USB device that provides touch-free interaction with your computer. With Pointwise, the device provides pan, zoom, and rotate using hand gestures. To download and begin using Pointwise V17.3 R2, go to the downloads page on our website, www.pointwise.com/downloads, or click the button below.